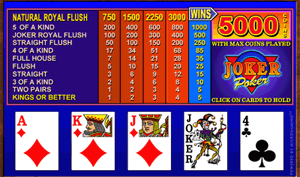 Joker Poker Video Poker is now a popular game available in every Microgaming powered online casino. A complete deck of 53 cards is used for each hand, instead of the normal 52 cards. The extra card is a Joker and is a wild card. The maximum payout in Joker Poker Power Poker is 5,000 coins.